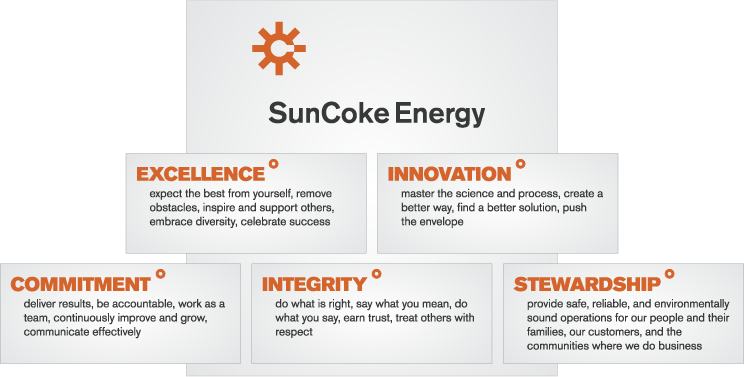 Our mission is to fuel our customers with coke, coal and power. We intend to grow our company and create value for investors through expansion of our current coke and logistics businesses and acquisitions in other raw material processing and handling industries, all while operating our facilities efficiently, safely and responsibly. Our values of Excellence, Innovation, Commitment, Integrity and Stewardship are at the heart of who we are and how we live and work every day. They guide our actions and decisions so we always do the right thing for our customers, our business and each other.